Packing can be considered an art form to some and packing for a winter holiday can make a 1000 piece puzzle appear easy. Here are some tips to help you this season. Now that we are in the heart of the winter season, travelling means lugging around a lot more items than we require at other times of the year, or does it? Here is a compiled list of tips from across the web on how to better pack you suitcase. Ditch the neck pillow. Do you really need this? If you answer yes, than try an inflatable version to save on precious carry-on space. Wear a jacket with many pockets. This is great as it allows you to place heavier items in your coat and reduces the weight of your carry-on luggage; excellent as many airlines are now charging for and weighing carry-on bags. Pack some dryer sheets. This is a great way to keep clothes smelling fresh. If you sweater feels like it just came out of the dryer, than you may not need to pack that second and third one. Bring a down filled coat. When heading to those extra chilling destinations opt for a down filled coat as they can much more easily by squished into small places. And since you left your neck pillow at home, you can use your coast as a cushion to rest your head. Roll your clothes. We’ve all heard about this tip, but does it work? Yes! 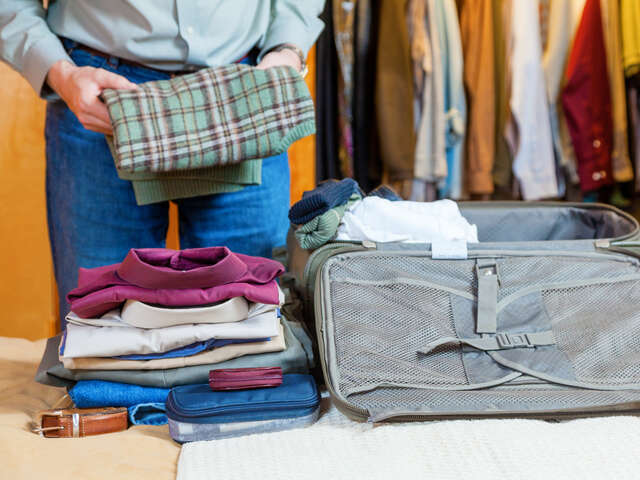 Rolling clothes (that don’t wrinkle easily) is a great way to save space. Many travelers also opt for those large, airtight bags, which are filled, then rolled to squeeze all of the air out of them. These bags are also great to use when trying to store that down filled jacket. Use hotel amenities. Check what your hotel offers as many allow guests to borrow phone chargers, extra toiletries or even curling and straightening irons. Kimpton is a great example if this with their “Forget It? We’ve Got it!” program. At Candlewood Suites you can borrow small tools, blenders and even a crock pot! Layer layer layer. Wear multiple layers, in particular things that can easily be worn or carried, without needing to be packed. Scarves, hats, gloves or light base layers could be worn on travel days, or rolled tightly and stuffed inside the shoes or boots that you will have to pack. Leave work out gear at home. If you plan to exercise while away from home, some hotels offer guests workout gear for rent. If you are heading to a warm destination and do not have the need for that bulky coat, check to see if your departure airport offers coast check services. Many airports offer this service for a nominal fee.